Yo, graphic designers! 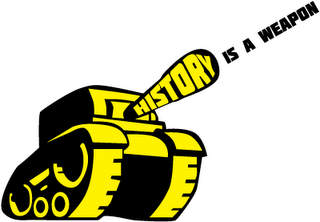 We need a sick logo, one good enough to convey history is a weapon and get on ffffound. If you, or someone you know, can make us it* on the free, we'd love to hear from you. Of course, we'll send you awesome presents that'll make your parents proud and school children follow you singing. Contact info us at: "the directorate at history is a weapon dot com," except translated into emailese. *it meaning a scalable vector in EPS, SVG, or AI document. Preferable with a Black and White and color option, but at least a black and white option. We really will mail you something awesome. EDIT: We received these two in the comment section. Keep working, people, we need a logo! 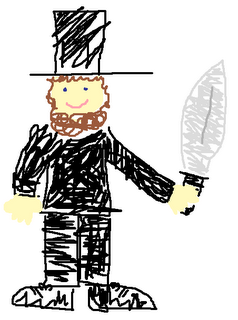 That Abraham Lincoln is awesome, you can send us contact info, but we're still looking for a logo. It is very interesting for me to read that blog. Thanx for it. I like such themes and everything connected to them. I would like to read a bit more on that blog soon. I would suggest a simple pen being set to paper. Is not the pen more mighty than the sword? lol @ editing the post to include my Stabby Abe picture. [url=http://www.home-businessreviews.com/Turnkey-Affiliate-Websites.html]affiliate websites[/url] and there was very interesting reviews about them but I still haven't decided what to do. Are here some members who have some opinion about sites reviewed at this website?